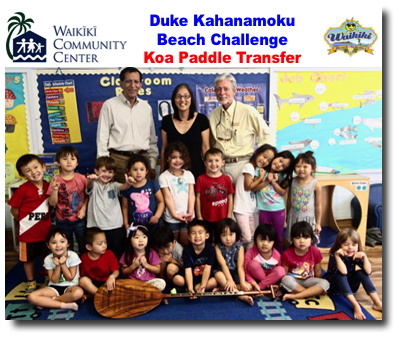 Honolulu, Hawaii April 4 2018 - Salah Ihsan the Director of Commercial Real Estate at the Waikiki Beach Marriott Resort & Spa, returned the prestigious Koa Paddle won by the Waikiki Marriott team in 2017 to the Waikiki Community Center. The perpetual trophy is awarded to the overall winner of the Duke Kahanamoku Beach Challenge held annually at the Hilton Hawaiian Village. The teams that compete are provided their own team tent on Duke's Beach along with all equipment needed to compete. The next Challenge will take place April 15. The final date to register is April 11. 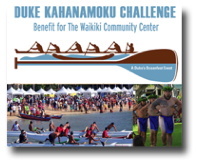 All funds derived from this event go to support the programs of Waikiki Community Center. This year, the Waikiki Community Center (WCC) will celebrate its 40th Anniversary of serving as a resource in caring for keiki and kupuna as `ohana. WCC is committed to strengthening the entire community by being a "one stop shop" for human services, social support, lifelong education, and wellness for Waikiki's families, keiki and seniors. The Center serves about 100 keiki daily in its early education preschool of which 75% are low income/subsidized, and over 20,000 seniors annually enabling them to be healthy, connected and have assistance to a quality of life befitting our kupuna. Interestingly, since the Center's services are so unique, about 45% of seniors come from areas surrounding Waikiki to take advantage of programs, case management and other services.